Image of the Coax to Quad-ridged waveguide transition. The quad-ridged circular waveguide transition consists of a circular waveguide with 4 ridges positioned in a cross shape. 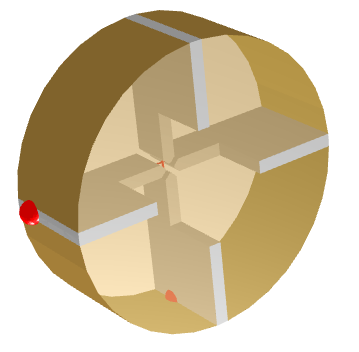 The two orthogonal coaxial feeds have the advantage of being able to support a fundamental propagation mode polarised in either of two orthogonal directions. This transition converts the coaxial TEM input mode to the fundamental TE11 mode at the throat/transition output. The throat is typically connected to a quad-ridged flare to create a quad-ridged flared horn (QRFH) antenna. The flare acts as a good matching device between free-space and the fundamental TE11 mode present at the throat interface. 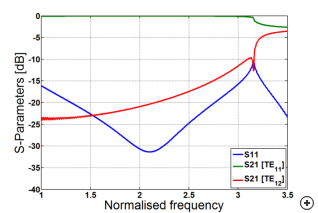 The transition is wideband with an operational bandwidth of 3:1. 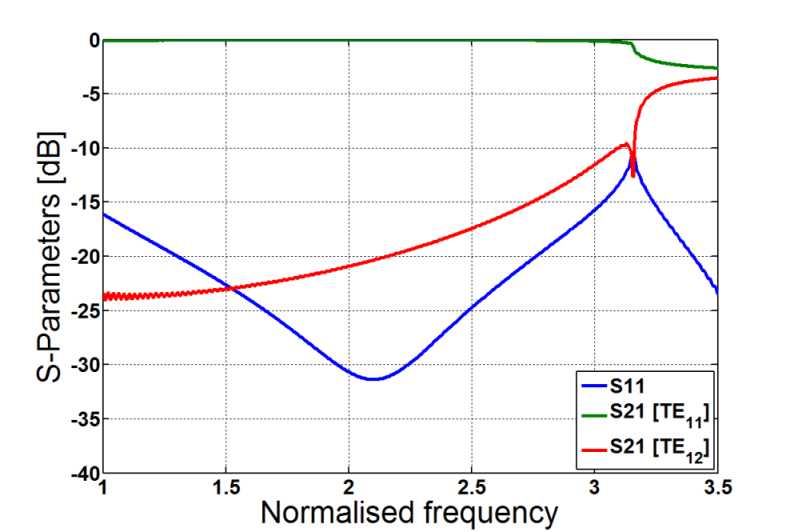 This bandwidth is limit by the cut-off frequency of the TE11 and the frequency where the secondary mode, TE12, starts to propagate. In order for the aperture distribution of the QRFH to be correct, the TE12 may not be present at the throat-flare interface.